Despite our strategies to bridge the visual ‘gap’ between the photograph and the thing being photographed, that distance stubbornly remains. Since the 1980’s I had been photographing the 562 Fisgard Street studio. 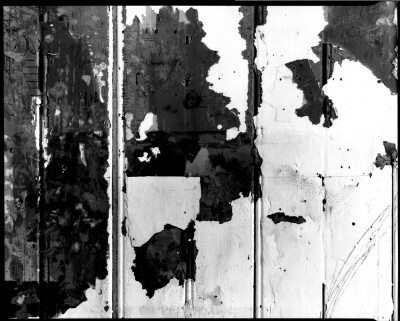 Recently, working with Trudi Lynn Smith we decided to embark on a photographic examination of the main studio wall. Some years earlier I had come across a very large set of bellows in a cupboard in the Visual Arts Department…. likely left after the dismantling of a copy camera somewhere on campus. 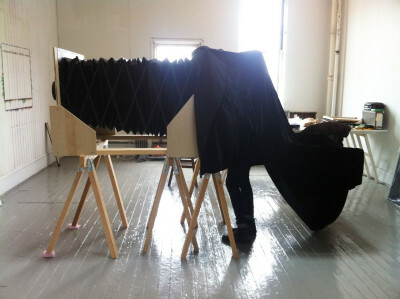 Starting with these bellows we pieced together a lens, a film holder , a ground glass screen and built a 16″ X 20″ camera. I made the large ‘dark cloth’ from black silk velvet. In an attempt to ‘bridge the gap’, we decided to photograph a 16″ X 20″ section of the studio wall at 1:1 scale on 16″ X 20″ B&W film which was later contact printed.